Place tomatoes, onions, jalapeño, cilantro, and lime juice into food processor. Pulse until salsa is the consistency you like. Store in refrigerator for up to three days. No green onions? Use about 1 tablespoon of yellow or red onion instead. Not a fan of heat? Replace the jalapeño with about 1 tablespoon mild banana pepper or green bell pepper. 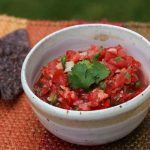 If you want a really chunky salsa, dice everything by hand and skip the food processor.